Marketing involves so much more than SEO and email marketing or even social media, that I have been heard to make grumpy noises when I hear people talk about them as if they were an end-all. They all have value, and they’re an essential part of a marketing strategy in many (not all) cases, but they don’t cover all the bases. If they’d sent ten emails I’d almost certainly have ignored all of them. As with most of us, the Delete key gets plenty of exercise when I’m going through my inbox, and I’m not at all diligent about investigating emails from senders I’ve never heard of when the only thing that’s visible is a subject. 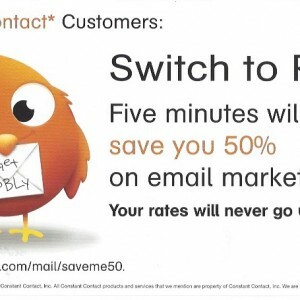 I also don’t have much hesitation in chucking junk snail mail, but a large, mostly-white postcard, as inelegant as this one is, with a ridiculously cute orange bird as its focal point? I just couldn’t ignore it. It got my attention long enough that I didn’t throw it away unlooked-at. It got me sufficiently engaged that I read and got its message. It prompted me to act. 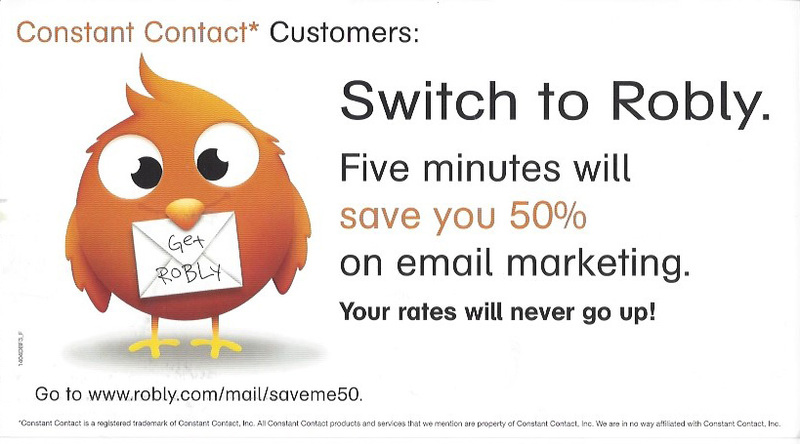 Notwithstanding the slightly Geico-esque approach (the 50% thing), and the awkward typography (which goes well with the nerdy awkwardness of the bird), I was so intrigued that I typed in the URL and spent quite a while on the company’s website to see what was on offer. That’s exactly what you need an ad, a postcard, a flyer or a poster to do, and that’s all you want it to do: create sufficient interest to make someone take action. In this case, the delightful visual appeal was an extra. I have instant liking for a company with a sense of humor, and this has “fun” plastered all over it. The self-deprecating mascot adds humor and therefore credibility to the piece. Loved this article and found it VERY useful. Thanks. You’re so smart. Very cool is right, Alan. Got my attention! Thanks for sharing. Thank you very much for your wonderful article and suggestion to use snail mail marketing. This is something we will definitely consider, as we need to boost ourselves out of Danger/borderline non-E in order to achieve our goal of rehabilitating Haiti. Hi Leslie! Thanks for the kind words. Just being visible is Square Zero for any type of ad, and Square One is being noticed. These guys achieved both in spades. A well done campaign.